1.7 Difference between Local SEO vs Organic SEO? 1.3How do Search Engine rank web pages? 1.4SEM- Grooving to Search Engine's tunes! 1.7Difference between Local SEO vs Organic SEO? 1.8Local Search Marketing and its need in today's world for location specific businesses! 1.9What are the possible ranking factors for Local SEO? 1.11Synchronising data across profiles - Why your information needs to be similar? 1.12How to build my Google Local Listings? 1.14How to create Yahoo Local Listings? 1.15Want to increase your Local rankings? Go for Citation Analysis. 1.16The checklist for Local SEO! 1.18Still struggling with your online reputation? Here is the remedy. 2.1Is On page optimization necessary to rank your webpages? 2.2Why do you need to do Keyword Research right before you start your SEO campaign? 2.4Is understanding Searcher Intent really important? 2.5Synonyms and their role in SEO! 2.6Is Domain age an important factor? 2.7Is your Site Structure SEO and User-friendly? 2.9How and Why does Title tag play a major role in attracting traffic to your website? 2.10Everything you need to know about Meta Description Tags! 2.11Are your Headings optimized for Search Engines and the users? 2.12The ever debated question: Are meta keywords really important? 2.13Are your Anchor Texts optimized? 2.14What does your site speed say about your rankings? 2.15Is title attribute really important? 2.16Is there any relevance of Robots.txt? 2.17Is your content SEO friendly? 2.18Is Duplicate Content a threat to your SEO strategies? 2.19Are you Optimizing your alt Images correctly? 2.20Woo your audience by optimising keyword density in your content! 2.21Catchy headlines and compelling body copy- the evergreen way to get noticed! 2.22Stuck with deciding the optimum Word count? Here is the solution. 2.23A walk through No follow Do follow links! 3.1What is Off page optimisation? 3.2Page Rank- Google's quality check! 3.7Is Link Exchange the way to go? 3.8Wondering about what is Cross Linking? 3.9Sweet simple ways to write a Blog Post! 3.10Does Blog commenting play a vital role in SEO? 3.11Is it essential to do Blog Marketing? 3.12How does Photo sharing help in your Link Building campaign? 3.13How does Video Sharing help in getting backlinks? 3.14Social Bookmarking and its use for your business! 3.15Directory Submissions: How to do it? 3.17Article Submission: Do they really bother? Difference between Local SEO vs Organic SEO? The increasing number of ways through which your potential customers can reach out to you, have become commendable through the advancement in technology. Certainly, whenever a user wishes to gather information about some place, person or thing, he would look out for the same online. Now, the subject of the search would determine the types of results that Google will show up with. Google has the absolute right to decide which websites earn the right to be displayed on the precious first slice of their SERPs and, therefore in some cases, it might include the local results with the organic ones, giving the users exactly with what they want, and thus leading to a happy and satisfied user. For business owner, both local and otherwise, these searcher’s reactions and satisfactions determine their success and failures. Now, when we mention SEO, most of the times it is associated with Organic SEO. Although, SEO is an evolving and imperative practice which has to be employed by webmasters to survive the online world, we fail to understand that Local SEO also forms one of the important aspects of SEO. Organic SEO is a marketing practice of optimizing your website to make it search engine friendly and get it ranked for relevant keywords. It might or not include a local element, but is usually not associated to a brick or mortar business. It essentially more or less, revolves around a website. The websites aiming at Organic SEO can therefore, be a full-fledged-internet-based-website which might or might not have a geographical location. Bloggers, Internet marketers, affiliate marketers, internet-based business and some brick and mortar business employ Organic SEO to work towards improving their rankings and increasing their traffic. Some examples of keywords that could be used in organic seo campaigns include ‘beauty tips’, ‘solar panel installation procedure’ etc. Only those websites rank in the organic results which have trusted content and can provide value to the users. So, you can say that in organic seo, search engines rank and favour trusted and relevant content. An example of organic search would be to search ‘Insurance Contractors’, the highlighted results are the organic ones. These websites which are ranking on this page, are considered to be legitimate by Google in terms of the content/services/information they offer. Now, what if you are a small insurance contractor in New York, how will you make your way up there? How would you let your users know about your existence? Here’s when Local SEO comes into the picture. These results basically show the insurance contractors that are relevant to the users and present in the New York city. The local results are usually labelled with customer ratings, reviews and other information about the business including hours of operations, directions, phone number, address etc. In simple terms, the search engines display the results based on geographically related keywords used in the search query. Some examples that could be used in local seo campaign include ‘florists in Pasadena’, ‘divorce attorneys in California’, ‘dog walkers in LA’ etc. 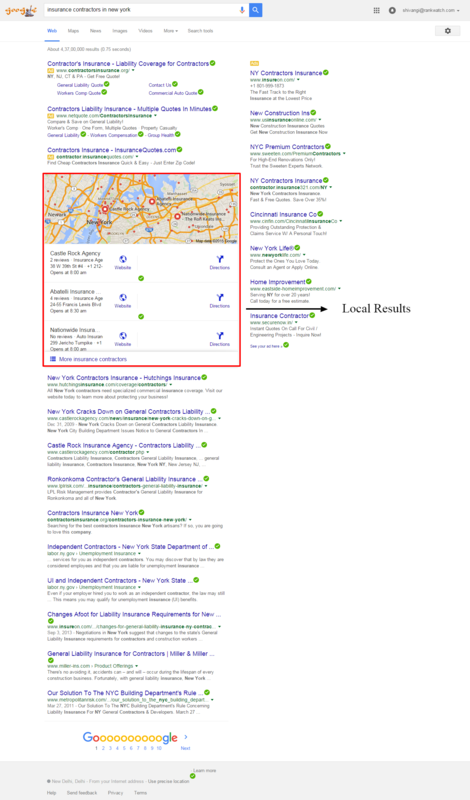 Those 3 results outlined in a box are the Google Local Listings Pack, which displays the top 3 relevant results. If you are a local business, this is the place where you would want to be. So, you can say in local seo, search engines rank and favour those websites which have relevant and trusted locations. I think by now, you have clearly understood the difference. But still, let me state that in clear words to get a better and clear understanding. The first difference is out there, shouting loud: Locations, locations and locations. Organic SEO is employed by websites that might or might not have a geographic location. It can be influenced by the location, but is definitely not attached to a brick-or-a-mortar business. Pure Organic results are a mix of businesses, articles, blogs, news, social media profiles etc. Organic search and results are totally independent of the locations. On the other hand, local SEO is essentially tied and associated with a brick-and-mortar business and necessarily has a geographical component. For example, if someone searches for a ‘car service in Pasadena’, the search engines would get, that the user wants a local business in Pasadena, that can service their cars. Therefore, here the search engines are looking out for trusted and relevant business that do car service around the user’s locations. Local SEO and Organic SEO do not necessarily target the same position on the SERPs. While Organic SEO aims to rank as high as it can for a specific set of keywords, the main aim of Local SEO is to get into the local listing packs. Additionally, Local SEO is about being present or listed (with consistent citations) at every other place where the potential customer might look for including niche directories, forum etc. Links (correction: quality links) are the votes in the world of SEO that could get you better rankings and increased traffic. In Organic SEO, high quality and relevant links help you increase the relevance and authenticity of your website in the eyes of Google. All factors remaining constant, the greater the number of quality links, the better is the ranking.Local SEO, on the other hand do not treat links in the traditional way, this role is played by Citations here. Citations are simply the mentions of your Business name, Physical address and Phone Numbers across the web. Being consistently cited at all the relevant and important places in your niche would increase the relevance and authority of your business in the eyes of Google. It would not count as a ‘vote’, but would definitely validate the existence of your business at a certain geographical location. This will increase the chances of your business to show up, if any query related to the similar business and locations comes up. As mentioned earlier, the aim of Organic SEO is to only reach at the top places on SERPs. To make this happen, a lot of On-page optimization and Off-page optimization is required to be done on the website including working on your title tags, meta-descriptions, heading tags, optimising anchor texts, creating amazing content, building an effective link building strategy and lots more. Local SEO, on the other hand aims to crack all places that displays local results. To make this happen, the strategy needs to be different. Apart from optimizing your title tags and keyword density, you need to first of all create a Google Listing. Going ahead, you should get listed at all the important directories in your niche and check for the consistency of NAP across the web, encourage the customers to write good reviews about you, write local content etc. Which of these is the best for your business? Businesses that go or Organic SEO usually aim to rank for specific keywords and trusted content. On the other hand, businesses that work on a local search marketing campaign aims to rank for particular location tied to the business. The choice of doing Organic SEO or Local SEO depends on the nature and kind of your business, as each has its merits. If your customers are not tied for a specific location, you would want to go for Organic SEO. On the other hand, if you have a business that sells its products or provides its services in a particular geographical area only, then Local SEO is the thing for you. We asked 25 industry experts, 4 questions regarding the future of SEO. Visit the Infographic to know the insights of Neil Patel, Rand Fishkin and 23 other. We asked 21 experts 5 questions about the future of content marketing; from their best strategies to rank content to their favorite tools - read it all here. We interviewed Top 20 experts, 5 questions regarding the future of Social Media Marketing; From primary strategies you use to engage with your social media followers to boldest predictions for The Future of Social Media Marketing. We have it all here! We asked 23 experts about the state and future of SEO in India. See what the experts had to say on the subject. Integrate your Google Analytics account and see how the various algorithm updates have affected your websites' traffic. How to Tell If Your Website Is Penalized by Google? 2012-2019 RankWatch, Inc. All rights reserved. Terms of Service & Privacy Pollcy.